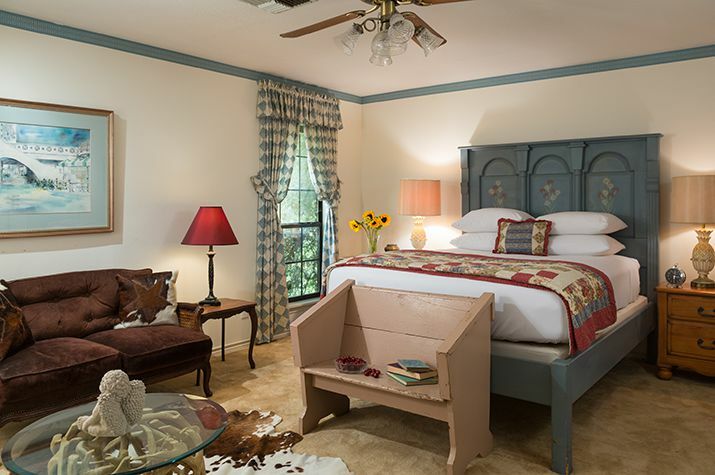 The Ranch House Studio is attached to the main ranch house, yet it’s cozy and private, offering the ultimate romantic getaway in Texas. The studio is located upstairs and has private stairs leading up to the studio. It includes a mirrored bar/kitchenette (with coffeemaker, microwave, toaster, two small refrigerators, dishes, glassware, silverware (no stove/oven); and a balcony with views of the front pasture. It offers 3 bedrooms (each with queen beds), 2.5 baths. Sleeps up to 6. Recommended for “quiet” guests who love dogs, as owner of BlissWood lives in Main Ranch House.